How to get rid of wasps? : Wasps are dangerous insects, which can truly wreak havoc in your home and life. Many people confuse wasps with bees. Bees are harmless insects and are mainly found in gardens where there are flowers. But wasps are very disturbing and aggressive by nature and can start attacking people for no reason at all. Wasps can be quite disturbing while working outdoors too. They can ruin a backyard party within minutes! Tackling wasps outdoors is no easy task! Especially when they enter your home, they are equally difficult to handle and trap. They will fly non-stop and keep buzzing as they find their way out of the room. If the wasp fails to find a way out, it can get infuriated and attack anybody who is in the room. Sounds scary? Wasps are indeed scary and their stings are rather painful too. It can take days for the pain from a sting to reduce. Many tend to have allergic reactions to the sting of the wasps and the allergy can aggravate to dangerous levels. There are many plants that deter wasps naturally. Some of these plants include mint, wormwood, citronella, and eucalyptus. The strong odor that these plants produce is great for keeping wasps away. Plus, these trees when planted in your garden, will enhance the beauty of your home and keep the surrounding air fresh and contaminant-free! Must read: How to get rid of ladybugs? Wasps are highly territorial in nature. They love defending their own colony and territory. Due to this, they tend to live within their own boundaries and do not venture into the territories of other insects or wasps. You can use wasp nests to your advantage and trap wasps. The wasps will believe that a new colony has been set up and will want to move in. Fake wasp nests are generally easily available in the market. Most of them are made of paper and they look so realistic that wasps think them to be original and real. 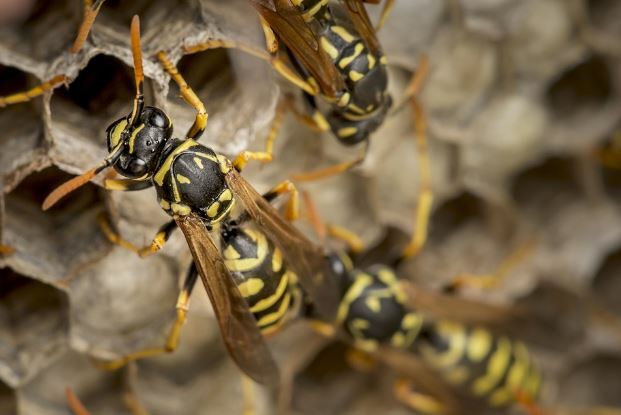 Naturally, wasps will not build nests within 200 feet of an already existing colony. Do keep this in mind when you hang false nets to trap wasps. Also check: How to get rid of moths? Soap sprays are one of the simplest remedies that can be used to get rid of wasps from your home or garden. For this, it is important that you locate the wasp nets first. Take a bucket and fill it up with some water. Now add some soap detergent to it and work up a lather. Take a spray bottle and fill it up with the soap solution and spray it on the wasp nests. While doing this, ensure that you wear proper clothing and protective gear so that you do not get stung by the wasps which may fly out when you spray their homes. If the wasps are in large numbers, you can use a garden hose for spraying the soapy water on the nests. Peppermint oil has a strong odor, thus makes it a great homemade wasp repellent. There are many insecticides which use a combination of peppermint oil and other chemicals and show great results. However, you can make your own spray which is 100% natural, safe and effective to get rid of wasps. Take 500 ml of water and add about 30 drops of peppermint oil to it. Mix them well. Now pour this solution in a spray bottle or can. You must add some shampoo or dish soap into the solution so that the peppermint sticks well. Spray this solution onto the wasp nests. After some time, you will find that all wasps are gone from your yard, garden or home. Also check: How to get rid of piss ants? Wasps are greedy insects that flock towards any kind of food items. Interestingly, the food demands of wasps vary depending on the season and time. Sweet as well as savory baits can be used to deal with these pesky pests. You can create a trap using juices in large tubs or basins. Wasps will find their way to the tub and drown in it. Some other liquids that can be used as traps include beer, water mixed with jam, soda pop, water mixed with syrup, honey or molasses, fruit juice, water with tuna fish, water with chunks of meat or hamburger etc. The wasps will get trapped in the tub and eventually die. However, bear in mind that killing the wasps by this method requires a lot of patience. Must read: How to get rid of stink bugs? Vinegar works like a charm to get rid of wasps. Take one cup water and add equal amounts of vinegar to it. Now mix the two ingredients well and transfer the solution to a spray bottle. You can spray this solution in areas where wasps are commonly seen. This method will not be very effective in killing the whole wasp nest, but it helps in getting rid of the wasps that come your way. Also check: How to get rid of termites? If you are looking for real-time wasp predator, plant a pitcher plant in your garden. This is a carnivorous plant and looks like a bulbous structure. The plant uses nectar, irresistible perfume, and extremely bright colors to attract the wasps. Once a wasp sits on the slippery surface of the plant, it gets trapped and is engulfed by the pitcher plant. Must read: How to get rid of spiders? These are some of the easiest ways to get rid of wasps. You may have to use a combination of more than one of these remedies for best results. Remember that patience needs to be exercised when you are dealing with wasps. Remain persistent and repeat the use of these remedies and you will soon have a home and garden free of wasps.